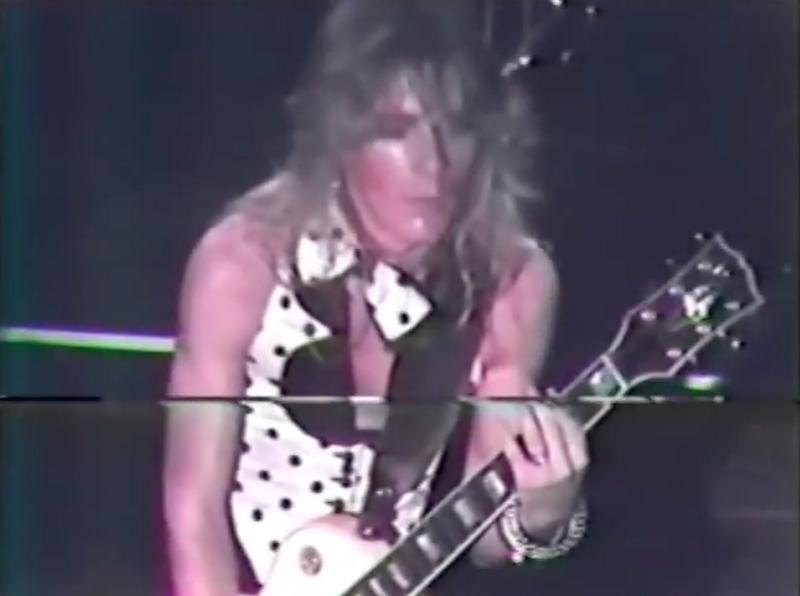 Recorded at Hollywood’s Whisky a Go Go nightclub on September 22nd, 1979 – Check out the video clip below for some amazing footage of one of Quiet Riot’s final shows with Randy Rhoads on lead guitar. Although featuring epic playing throughout from Rhoads, be sure not to miss his solo around the 37-minute mark of the set, as he performs some incredible improvisation mixed with a few familiar phrases and patterns that would later be heard in some of Randy’s work with Ozzy Osbourne. The show is also notable for being the first appearance of his custom made black and white polka-dot Flying V.
Built by luthier Karl Sandoval at a cost of $738. The guitar that would become synonymous with Rhoads had just picked it up that very day, so chances are, the Whiskey’s audience were the first to hear it in action. Rhoads did things that others dreams of doing. The world will never kno how great Randy could hav been. Randy will b dearly miss,an may his sprit live on n each of us who loved an respected the mans talent. R.N.P. RANDY RHOADS.